On one of my recent Youtube binges I noticed a trend with many of the comments from the music videos I watched: they were requests for mp3 versions of the videos. I started thinking about possible solutions and realized that the Zamzar video conversion plugin for Firefox was just the remedy. 1. Load the video you want to make into an mp3 in Firefox. 2. 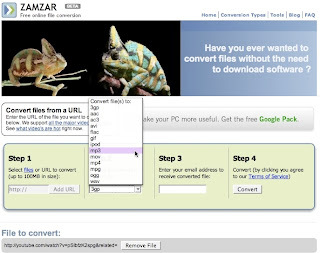 Click the "Convert with Zamzar" button that has been newly installed into your bookmarks toolbar. Step 1 has already been completed for you. For step two, "Choose the format to convert to," select "mp3" from the drop down menu. Click convert for Step 4 and you're done! Zamzar will convert the desired file for you and email it to the address you specified in step 3. I tried this technique with the Imogen Heap - Just For Now (live at Studio 11 103.1FM) video and it worked perfectly. I hope this helps you guys.